Home / Publications / Why Do Some People Become Citizen Activists? Why Do Some People Become Citizen Activists? Today we are pleased to announce the publication of a new research article entitled, “Climate Change Activism among Latino and White Americans” in the journal Frontiers in Communication. Maintaining a safe and stable climate requires a massive reduction in the emissions of the pollution that causes global warming. Government policies are one important means to achieve this goal, which requires elected officials to enact, implement, and enhance these policies over decades. Yet, there remains a critical lack of “political will” for climate action in much of the United States. One important influence on government officials (among others) are engaged citizens demanding action from their leaders. But what leads people to become active citizens on climate change? In this paper, we investigate and compare a variety of potential explanations. 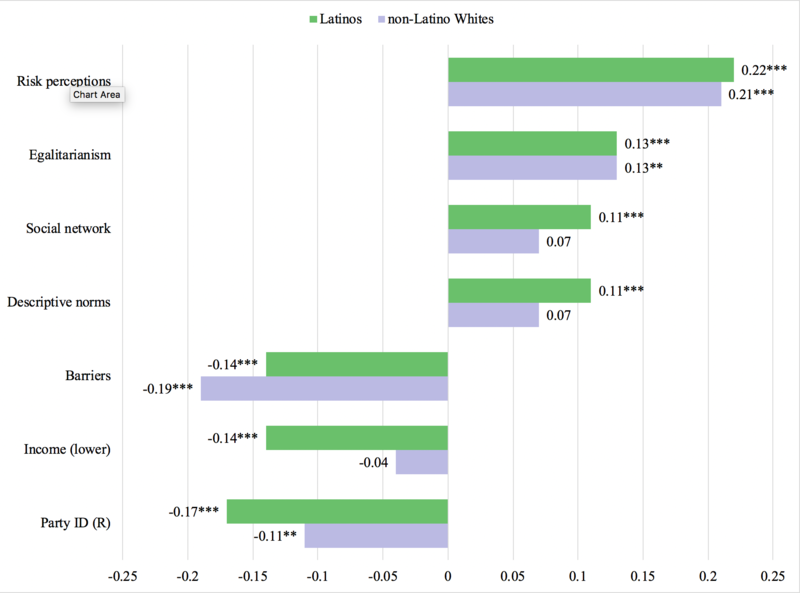 We also compare and contrast the predictors of citizen activism for Latino and non-Latino White Americans. In 2017, we conducted two parallel, nationally representative surveys of climate change beliefs, attitudes, policy support, and political behavior among Latinos (n = 1,433) and non-Latino Whites (n = 861). We found that Latinos are more likely than non-Latino Whites to have contacted government officials about global warming in the past and are more willing to contact government officials in the future, indicating that in some important respects, Latinos are leading the way. Meanwhile, the factors that predict citizen activism are very similar for both groups. The single strongest predictor of citizen activism overall was risk perception – perceiving global warming as a greater risk to oneself, one’s family, other people, future generations, and other species. The greater the perceived risk, the more likely Latinos and non-Latino Whites were to contact government officials, urging them to act. Personal contact by an organization working on global warming was another factor that predicted citizen activism, indicating that grassroots organizing is particularly important. Finally, perhaps unsurprisingly, the more barriers individuals perceived the less likely they were to take political action. The barriers most often cited were “no one has ever asked me to contact elected officials about global warming” and “I don’t know which elected officials to contact.” Grassroots organizations that lower or remove these and other barriers can help build greater public will and demand for political action. ***p < 0.001; **p < 0.01; *p < 0.05. Values refer to standardized beta weights. For example, greater perceptions of risk are associated with greater intentions to contact government officials. Barriers, lower income and Republican party ID are associated with lower intentions to contact government officials. Overall, we find that there are many Latino and non-Latino White Americans willing to contact government officials to urge them to take action on climate. Raising public understanding of the risks of climate change and that the impacts are here and now can increase the number of Americans willing to get involved. But organizations must also reach out to these citizens, ask them to participate, train, support and amplify their voices, and invest in building a social movement in parallel with, and ideally in synergy with, research and analysis, policy development, legal strategies, and direct lobbying of decision makers. The full article is open access and provides many more details on the study and the findings. Ballew, M. T., Goldberg, M. H., Rosenthal, S. A., Cutler, M. J., & Leiserowitz, A. (2019). Climate change activism among Latino and White Americans. Frontiers in Communication, 3(58), 1-15. Is Nature Stable, Delicate, or Random?